The Friends of the Tarpon Springs Public Library, Inc. is a membership organization whose mission is to enhance library services and promote the use of the library. The Friends raises money to benefit the library and provides volunteers to help run programs and fundraising events. The Friends operates the used book sales in the library in the Friends’ Bookstore and at special sales. In 2014, the Friends of the Tarpon Springs Library celebrated fifty years of library support and service to the community. 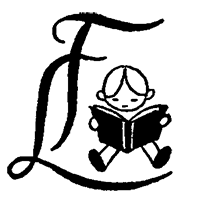 Our official logo was designed especially for the Friends of the Tarpon Springs Library by Lois Lenski. Lenski was an award-winning author and illustrator of books for children and young adults, an enthusiastic advocate for children’s literacy, and a charter member of the Friends of the Tarpon Springs Library. Membership in the Friends of the Library is open to the public. Print a membership application. Become a Friend to support your library through membership. Call us at (727) 944-3042 for additional information.